When I was growing up, my favorite thing to do in the summertime was invite a few friends to my house and put up a tent to go ‘camping’ in the backyard. I even learned how to put up our huge 3-room tent by myself at the tender age of 13! My best friend, Ariel, came to every little party I had. We lived a few miles from each other, which was awesome! There are so many funny memories from the times that we went camping, ranging from shaving cream fights and water balloon wars, to re-counting nightmares about giant pudding cup men and telling scary stories. Plus, we could be as loud as we wanted, eat tons of snacks, giggle uncontrollably, and my parents enjoyed peace and quiet inside the house! Except for the time it rained and the tent leaked so we had to go inside at 4 am. Oh, and we always had to have a cookout just to have some s’mores! That bring me to these cupcakes. They’re amazing. I made them for Ariel, because we both really love cupcakes and s’mores remind me of our camping adventures. She’s been in almost all of my best childhood memories, plus we’ve worked/gone to school/lived/road-tripped together over the last 7 years. Whenever we hang out, we talk and laugh a mile a minute until our throats hurt! 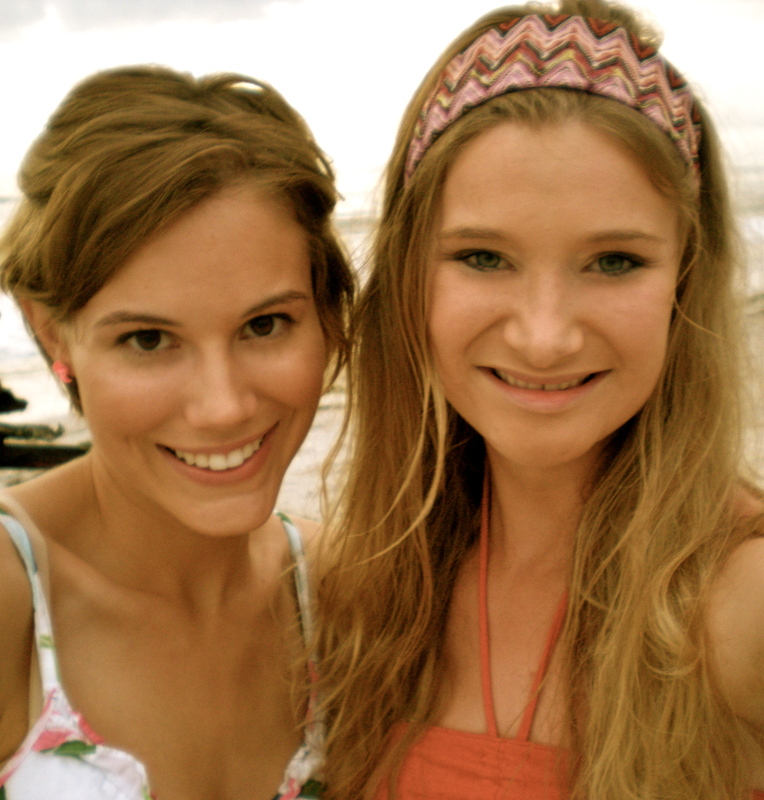 Me and Ariel, in Florida! 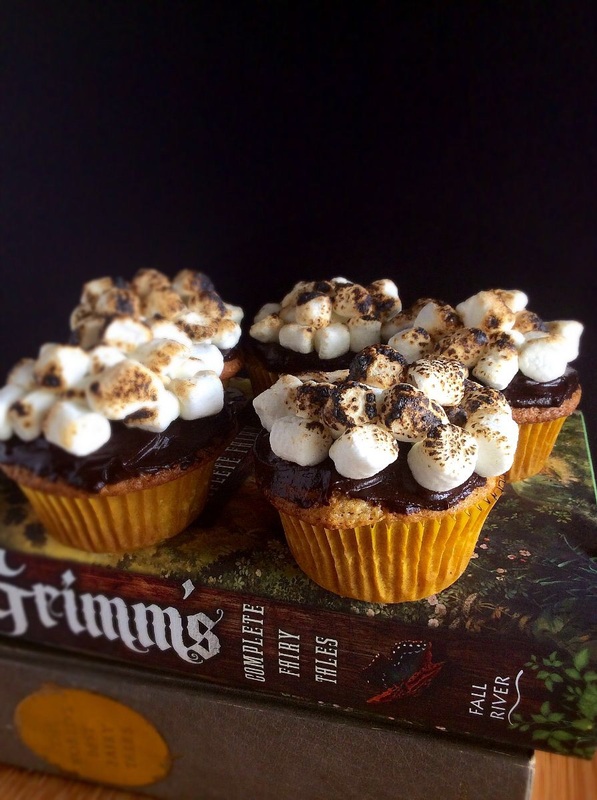 The idea behind these cupcakes is a graham cracker cupcake filled with marshmallow creme, topped with dark chocolate ganache and some marshmallows that get torched. 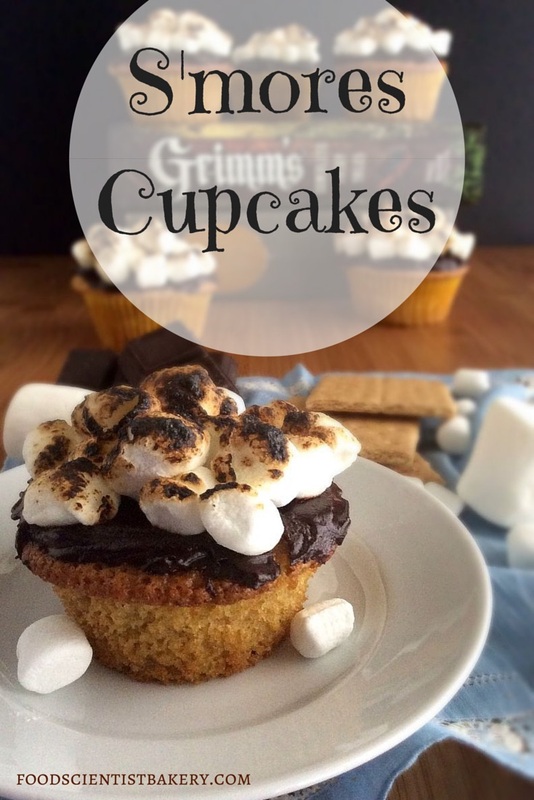 There are a lot of versions of s’mores cupcakes out there, but my gosh, I LOVE this one. The cupcakes are very moist, fluffy, and taste like a graham cracker. The marshmallow center is a hit of sweetness and is balanced by the dark chocolate ganache. 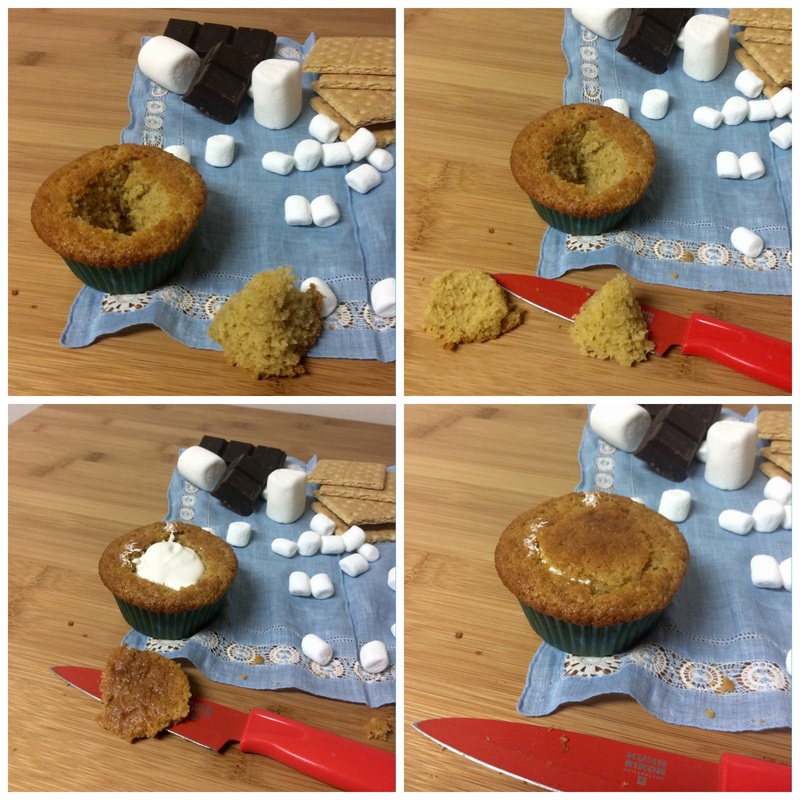 The marshmallow topping is optional, but it does add a great ‘burnt marshmallow’ flavor! Summer is coming fast, so celebrate and make some cupcakes! Preheat oven to 350 F. Line cupcake pan with paper liners. In large mixing bowl, beat butter with mixer until fluffy, about 30 seconds. Add sugar and beat until very light and fluffy, ~5 min. Add egg yolks one at a time, beating for 30 seconds between additions. In small bowl, whisk together egg whites until voluminous and foamy. In medium bowl, sift together flour, cornstarch, graham cracker crumbs, baking soda, and baking powder. Fold 1/3 of flour mixture into butter mixture. Add 1/2 cup of milk. Mix. Add another 1/3 of the flour. Add remaining milk and remaining flour mixture. Add egg whites and fold until just combined. Scoop batter into liners 3/4 full and bake for 15-18 minutes. Cool completely on wire rack. In medium bowl, beat together marshmallow fluff, butter, and vanilla until light and fluffy, about 3 minutes. In microwave, heat chocolate in 30 second intervals until melted, stirring between each interval. Remove from heat and add cream, stirring until well blended. Let cool slightly. Spread a thick layer of chocolate glaze on top of cupcake. Top with several small marshmallows. Let set for a few minutes or put them in the fridge for a few minutes if your kitchen is warm. Turn oven to broil, and place cupcakes onto cookie sheet in top shelf of oven. Leave in for just a minute or two and watch carefully! Alternatively, use a kitchen blowtorch (I have one and MAN, is it fun to use!). 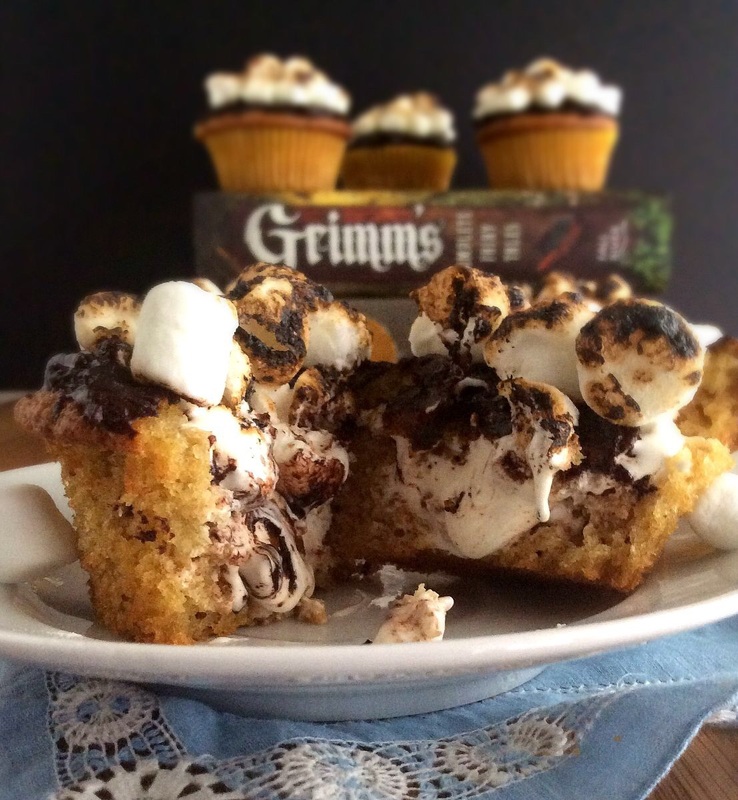 These look gooey and delicious just like a s’more! The perfect summer cupcake, yum!! Yes! They’re very gooey and delicious! It’s crazy how much they taste like eating a s’more. Of course, nothing beats the real deal, but these are a less messy option! Those marshmallows are toasted to absolute perfection! This looks irresistible! I’m definitely trying these! S’mores are my FAVORITE. Oh, awesome! I hope you enjoy them! They’re really easy and fun to make!